Fitz And The Tantrums new single, 'Moneygrabber' will be released on August 15th via 'Dangerbird Records'. It is taken from their upcoming debut album, 'Pickin' up the Pieces', which will be available from August 22nd. The music video for 'Moneygrabber' was directed by Michael Mohan and features overlapping shots of the band performing the song underneath blue and red stage lights. Fitz and the Tantrums formed in 2008, with the lineup: Michael Fitzpatrick (lead vocals); Noelle Scaggs (vocals and tambourine); James King (saxophone and flute); Joseph Karnes (bass); Jeremy Ruzumna (keyboards) and John Wicks (drums). Many of the members have had success with other artists: Jeremy was previously Macy Grey's pianist and Noelle has sung for the likes of Dilated Peoples and the Black Eyed Peas. Their first EP, 'Breakin' the Chains of Love', was released in the UK and garnered support from well known DJs such as Jo Whiley, Lauren Laverne and Dermot O'Leary. 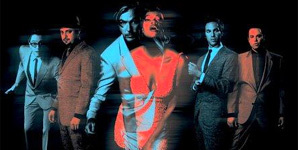 Fitz and the Tantrums have toured with bands such as Flogging Molly and Maroon 5 and have performed on 'The Tonight Show with Jay Leno'; 'Jimmy Kimmel Live!' and 'Last Call with Carson Daly'. 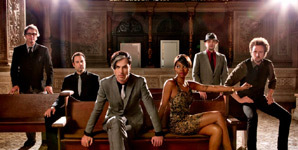 Fitz And The Tantrums: Where Did It All Begin?